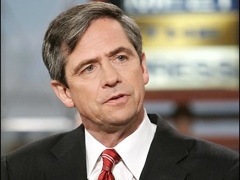 The White House denies that it ever made such an offer, which means either the Obama administration or Sestak is lying. Either would be a huge story. Yet a number of major media players, including the Washington Post, National Public Radio, and the Associated Press, have ignored the potential controversy. The Washington Post devoted 16 paragraphs to a glowing profile of Sestak. But at no point did the paper mention his allegations. The Weekly Standard's Stephen Hayes noted on Twitter that the piece in the Post "was about Sestak being difficult for estab/WH Dems. How do you leave out public charges he made about WH and job?" He also asserted that "If players/parties were different, it wld be at the top of the coverage." NPR claims to be "Filling in the Blanks" on Sestak's candidacy, yet the biggest blank of all -- whether he was offered a bribe by White House officials -- goes conspicuously unfilled. NPR even goes so far as to note that "the White House had, indeed, encouraged him not to run against the incumbent senator," yet somehow cannot bring itself to mention the alleged bribe. The Associated Press ran a much shorter story on Democrats and union leaders who "have begun lining up behind the party nominee [Sestak] whom they had fought to defeat in Pennsylvania's U.S. Senate primary." Yet the most prominent and damning measure undertaken to prevent Sestak from winning the nomination escaped mention in the AP report. By itself, the potential controversy should remain at least in the first couple paragraphs of any report on this race. But compounding the story's relevance are prominent Republicans who are demanding a formal investigation into the charges or noting that such an investigation would be welcome. Rep. Darryl Issa, R-Calif., ranking member on the House Oversight and Government Reform Committee, said that Sestak has a "moral imperative" to inform the public on any malfeasance by the administration, something he has thus far refused to do. Could the reason why Congressman Joe Sestak refuses to name names is because the very people who tried to bribe him are now his benefactors? For months, Sestak has repeatedly said without equivocation that the White House illegally offered him a federal job in exchange for dropping out of the race. Was Joe Sestak embellishing what really happened or does he have first-hand knowledge of the White House breaking the law? If what he said is the truth, Joe Sestak has a moral imperative to come forward and expose who within the Obama Administration tried to bribe him. Some news outlets, including Fox News and CNN, have reported on the story to the greatest extent possible. In fact, Issa named Rick Sanchez, CNN anchor and friend of NB, an "honorary watchdog" for his willingness to ask questions of the White House -- questions on which White House press secretary Robert Gibbs said he had "nothing to add." The question is why other news outlets have not done the same.